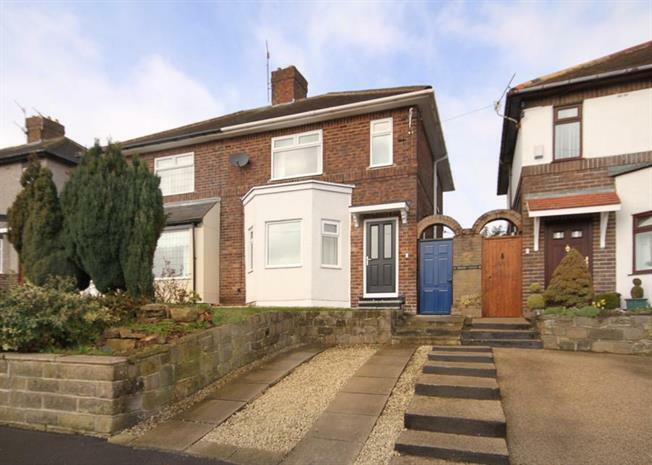 3 Bedroom Semi Detached House For Sale in Sheffield for Guide Price £190,000. An early viewing is absolutley esserntial to appreciate the stadard of accomodation on offer in this beautifully presented three bedroomed semi deatached home located in sought after and conveneient Stannington Village. Offering spacious accomodation over two levels, the property has undergone significant upgrading by the current owner to a high standard throughout. with the benefit oif double galzing, GCH, and lovley views to the front. The accomodation comprises an entrance hallway with stairs to first floor landing. The lounge has baywindow to the front with carpeting and decorative fireplace focal point. The Dining Kitchen is fitted with an excellent range of units in a modern high gloss finish with contrasting block wood work surfacing. Coming complete with inset sink, integrated oven, hob and extractor, tiled splash backs and flooring and a useful pantry. A rear lobby has access to a furher useful under stairs cupboard. On the first floor, the Master bedroom is carpeted with window to the front offering views across the Valley. Doubl ebedroom two is carpted with rear wwindow overlooking the grden. Bedroom three offers flexible accomodation as third bedroom , study or nursery The Bathroom has modern three piece suite in white comprising WC, wash basin and bath with showert over and screen, tiled splash backs and window to rear. To the exterior of the property is a driveway providing off road parking, a raised front garden area and to the rear a lawned garden providing an excellent outdoor seating, entertaining and play area. An ealry viewing is absolutley essential in this much sough after location.